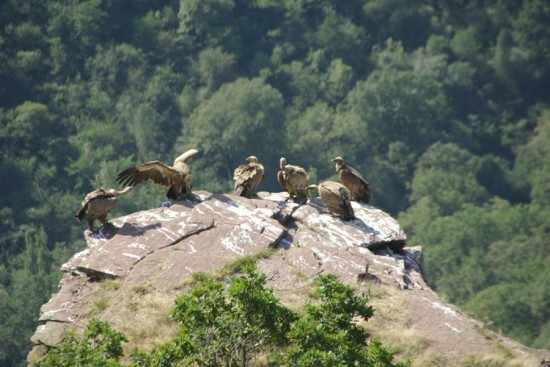 One of our most spectacular walks is to the protected area of Las Peñas de Itxusi where we walk along the clifftops of the most northern, ‘natural’, Griffon Vulture breeding grounds in Europe. 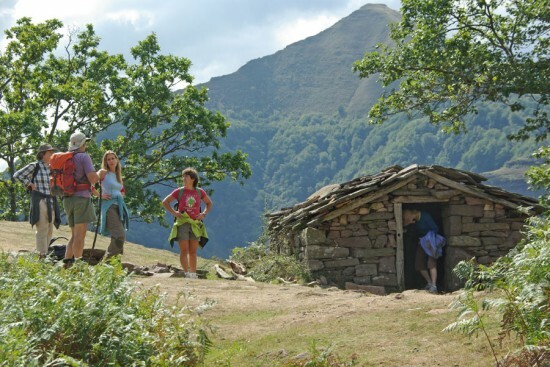 Itxusi is the Basque word for ‘ugly’, a name given to the area by the shepherds who dreaded loosing a sheep to the steep rocky crags of this spectaculary wild part of the Pyrenees. 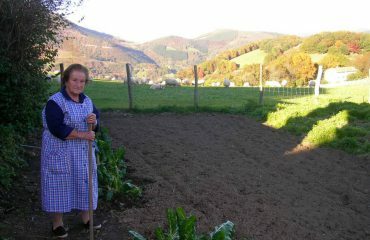 The area is found right on the borderland between Spain and France to the extreme west of the Pyrenean mountain range. For centuries the vultures here, ( some of almost 3m wingspan), have held vigil while Basque shepherds would smuggle flocks of sheep and horses, refugees and British airmen, over the mountain pass below. Watching the Griffon Vulture close up is an arresting, if not disconcerting, sight with its devilishly hunched form, bald head and scruffy white feathers hung loose around its neck. Inextricably linked with death and the macabre, the Griffon Vulture feeds on carrion and has also been known (among my farming neighbours) to attack weak newly born lambs and calfs. Here in Ameztia (my own mountain hamlet not far away) the sighting of flocks of vultures is virtually a daily occurence . On a morning run I often stumble upon them as they are feeding, and they take awkwardly to the skies with heavy laboured flaps. They are gliders and are not too good at take-offs and landings. After a bout of rain, I have occasionally seen the whole flock sitting in on a sunny slope in a field; their enormous wings spread out around them to dry. The Griffon Vultures breed in Itxusi (not far from Ameztia) in permanent colonies and the female lays just one egg at a time. This is usually in early spring. Both she and her partner take turns to look after the young and can fly up to 300 km in one day in the search for food. The young take 3 – 4 months before they are fledged, forced to take to the skies only when their parents stop feeding them; leaving them to fend for themselves. Itxusi is an incredible place, not only for its total lack of tourists and preparation: you will find no lookout points, nor cameras, nor information panels, just the odd local guide who knows their way in. Despite the terrain this is a relatively easy walk along the cliff tops where waterfalls cascade down below us to the valley floor. Here we find ourselves on a level with their nests, at close quarters, eye-to-eye with the vultures who fill the skies around us. After a picnic by a mountain pool, often accompanied by wild horses, we slowly make our way back home. 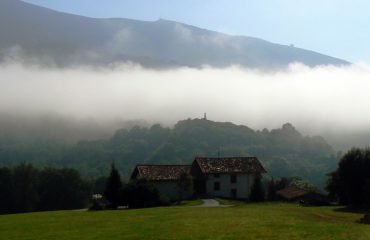 See our links to articles on us in the Guardian here: http://www.theguardian.com/travel/2010/apr/17/spain-basque-navarre-culture-walking. Thanks for telling us how to get to the Vulture cliff on Itxusi. You are right that it is difficult to find from the Spanish side. We ended up going a long way round, but it was worth it. There was a group sunning themselves on a rock and others flying back and forth to the cliffs feeding the youngsters. 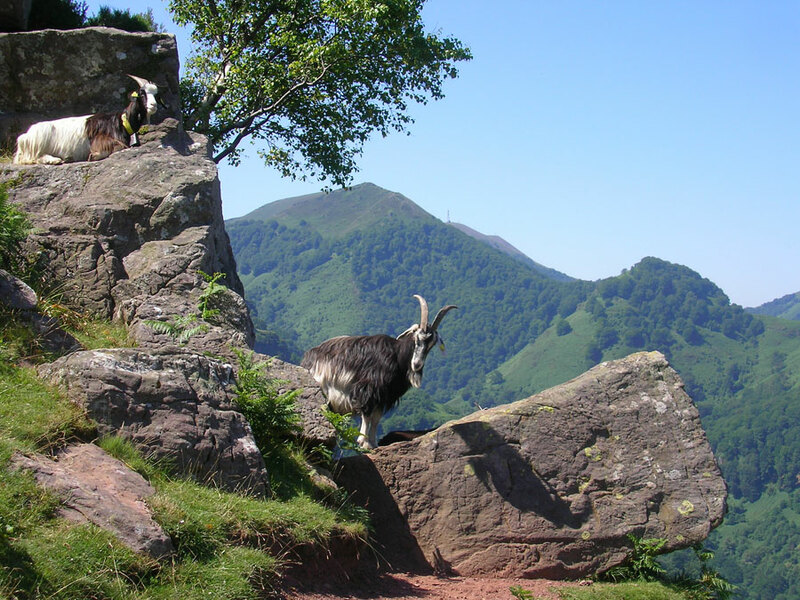 Some years ago, when I was walking the GR10 on the French side of the Pyrenees further east I saw a group of vultures at close quarters tearing apart the carcass of a sheep – see http://pyreneanway.com/gabas-luchon.shtml.